It’s recipe swap time again! 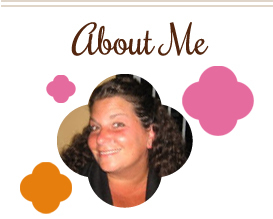 This time, for Blogger’s Choice, I was assigned Tina’s blog, Tasty Treats by Tina. I had a few things bookmarked, but ultimately I chose a dish that I threw together with some leftovers that made a great lunch! Normally I wouldn’t think of putting cucumbers in a taco salad, but like I said, I was basically cleaning out the fridge with this one 🙂 So, anything goes…feel free to toss in whatever you have on hand. I would have loved some jalapenos in here…and olives…what can I say, I was overdue to go shopping! Obviously, a shell would be fantastic for this (or even chips underneath) – but if you’re keeping it low carb, this is the way to go! You don’t even miss the carbs with this one. Thanks for a great salad, Tina! Place meat to a large skillet and cook over medium high heat. Add cumin, chili powder, garlic powder, salt and pepper, and stir to combine while cooking. Once fully cooked, remove from pan and drain fat. Combine all veggies in a bowl. Add meat and cheese. Mix salsa and sour cream in a small bowl, and use as dressing for salad. This entry was posted in avocado, beef, low carb, main dishes, Mexican, QuickAndEasy, salad, tomatoes. Bookmark the permalink. 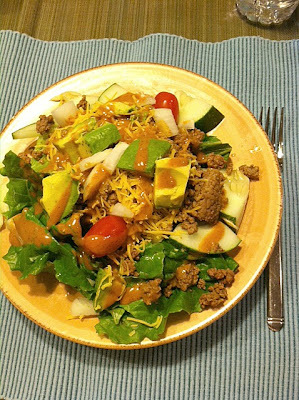 Taco salad is always a winner. Such a good go-to meal! Mmm I love taco salad!! And finding a way to lower the carbs/calories is always great! Looks like a great salad! Thanks for being part of the recipe swaps. Ooh I love this idea! Looks great! Cucumbers in a taco salad? Who would have thought?! I’m so glad you liked it! Sometimes I top it with the crispy tricolor tortilla strips. This salad sounds great! I love that it’s so versatile! Awesome idea – I don’t like the hard tacos anyway, so this would be a perfect alternative for me!